CHARLESTON, W.Va. — A southern West Virginia town in the state’s poorest county has joined other communities in seeking to recoup the costs of dealing with opioid abuse. According to the CDC, West Virginia had the highest rate of opioid-related deaths of all states in 2015, at 41.5 per 100,000 people. The Charleston Gazette-Mail reported that the McDowell County town of Welch filed a lawsuit Monday against five of the largest out-of-state drug distributors. The lawsuit claims the companies delivered huge amounts of prescription pain pills that created a “public nuisance” in the town of 2,200. Welch is the county seat of McDowell County, which has the highest drug overdose death rate in the nation. The McDowell County Commission sued drug distributors in December. Similar lawsuits have been filed by the cities of Huntington and Kermit. 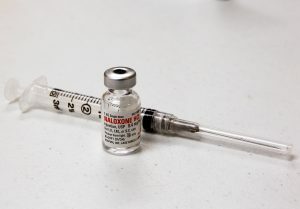 “We believe that these copycat lawsuits do not advance any of the hard work needed to solve the opioid abuse crisis – an epidemic driven by addiction, demand and the diversion of medications for illegitimate use,” Ellen Barry, senior vice president of Global Corporate Communications at Cardinal Health, one of the five companies named in the lawsuit, told the PBS NewsHour. An investigation by the Charleston Gazette-Mail found drug wholesalers shipped 780 million hydrocodone and oxycodone pills to West Virginia in six years. The Gazette-Mail says McDowell County, population 28,000, received 9 million hydrocodone pills, and 3.2 million oxycodone tablets over six years, according to U.S. Drug Enforcement Records. Welch alleges that the drug wholesalers didn’t do enough to stop prescription painkillers from getting into the wrong hands. “The (companies) received compensation in the form of millions of dollars per year for shipping volumes of drugs well beyond what a reasonable company would expect,” Welch’s lawyers wrote. Welch has had to pay for more emergency services and drug treatment programs in addition to dealing with an increase in litter, crime, housing code violations and clogged water and sewer lines, according to the lawsuit. “We intend to defend ourselves vigorously against these allegations,” Barry said. The newspaper reports that drug companies have denied wrongdoing, saying the drugs were shipped to licensed pharmacies, which were filling prescriptions from doctors. West Virginia sits on the front lines of the opioid epidemic, which now affects every state in the U.S. The hardest hit include men “with annual incomes less than $70,000, those previously married, and with a high school-level education or less,” according to the National Institutes of Health. White and Native American men living in the Midwest and West had a higher rate of use. Huntington, which has also filed a lawsuit, reported 26 overdoses in a span of four hours in August.